This post was written by Joyce. You have to admire the perseverance of a would-be mother hen. I have a Salmon Favorelles named Laverne who would starve on the nest before she would give up being a broody hen, even when there are no eggs under her. As a rule, when I’d like a broody hen to hatch some special eggs, I will put her in a separate pen where chicks would be safe upon hatching. Usually a broody hen will quickly settle into the new nest full of precious eggs and happily go about hatching. Not this one. Laverne refuses to be relocated to a safer place. Under normal circumstances, when I separate a broody hen and give her NO eggs, she will run up and down the chain link fence for a couple of days and then they forget all about being broody. Not Laverne. In her new location, this broody hen throws herself against the chain link fence and is so violent in her protests that, to save her life, I have to put her back in the main coop with everyone else. Being broody can create issues for the broody hen in question, because they do not leave the nest to take dust baths and are more vulnerable to mites and lice. In addition, and most importantly, they lose weight and condition which is detrimental to them. They also quit laying eggs, which is detrimental to me. So putting Laverne back in the main coop, I order new little chickies for her. After their arrival, I wait until I am sure they are over the stress of shipping. Then under cover of darkness, I gently place the fuzzy, darling chicks under their would be mother, Laverne. The following morning, at the crack of dawn, before the coop has come to life, I sneak out there with a box and put Laverne and “her” chicks into the box and move them to the safety of the chain link pen that has hardware cloth all around the bottom so that no tiny chick could possibly squeeze through. Laverne, my broody hen, is happy, I am happy and of course the chicks are happy. All is well, and this broody hen, for the third year in a row has gotten the best of me, forcing me to allow her to become a mother. However, during this, her third year, Laverne has taken the mother hen stuff to a whole new level. Normally, after Laverne, or any broody hen, has been with her chicks for 5 weeks, I will remove them from the chain link pen and they are quite happy to go back to their old way of life with the flock in the main coop. Well, mark my words, being separated from her chicks was a fate worse than death for Laverne and she didn’t want to go quietly into that dark, cool night. She began her frantic attempts to get back into the chain link pen with HER babies. Eventually I succumbed and let her back in, rather than watch her die of a heart attack racing about. Giving her a couple more weeks with her babies, I then try again with the same results. Laverne wins. Okay, forget it, keep your babies! Later when the chicks were 12 weeks of age, I opened up the pen and let Laverne and all of her babies (who are no longer babies) out into the great big bird world with all the adult hens. That was a month ago. Laverne does not care that the chicks are nearly as big as she is. She is insistent on being their mother and among a flock of 80 chickens she keeps her brood all to herself. She clucks to them constantly, to keep them in line, and they obey with the regimentation of soldiers. So I give up. Laverne is stronger than I, and bless her for it. Well, interestingly, I have a very broody Salmon Faverolle whose name is Joyce! Aww, Laverne is so adorable! Oh my gosh this is the funniest read I have read in a long time. I cracked up over these reads. I can just see Laverne throwing herself on the fence and then when the one chicken rejects the babies, so another one takes them and they are happy everafter. Then the first one wants them back. Oh please keep me laughing. I want to know more. When hens are “broody” do they lose their ability to make sounds? One of mine is acting strange, she eats some but hangs back from the other two and she likes to make a whole in the dirt and sit in it. ( I have only three) what could be the problem? No, broody hens can still make sounds–in fact, if someone gets to close to their brooding area, they often quite loudly try to caution you away! They also make purring and cooing sounds to the chicks in the eggs. 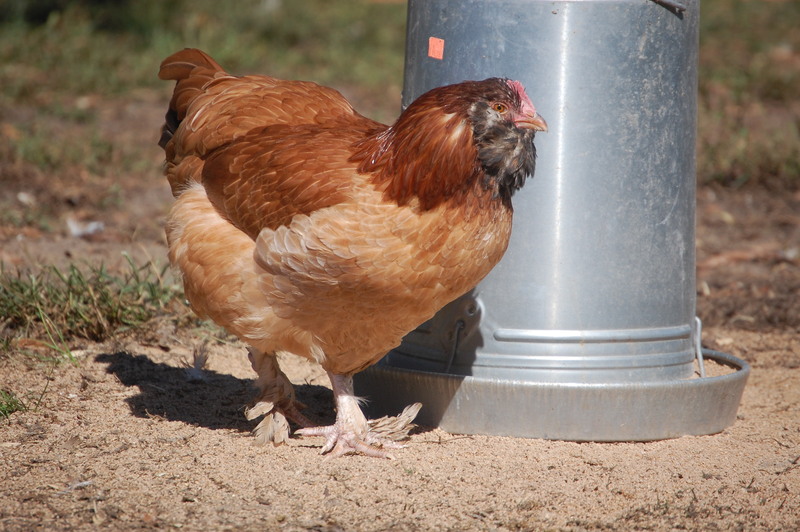 If your hen is digging herself into the dirt a lot, one possibility is that she’s suffering from mites or lice–the dust bathing is a way they try to drive them away. Please check all your birds carefully. If one has them, they all do! It’s not unusual for one bird to have a worse infestation, so if you see external parasites on one, they will ALL need to be treated. You can read about the signs of and treatment for mites or lice here. If this isn’t the problem and you think your girl may be sick, you should consult with a vet to get a firm diagnosis and treatment options. Okay..I have Blanche and she is a banty cross of some kind. 3 weeks ago I got 4 baby chicks and a few days after I moved them to a separate pen in the chicken yard Blanche went broody!! Should i put her in the pen with the almost 4 week old chicks?? It is not likely Blanche will adopt 4 week old baby chicks. Normally when a hen is broody and you want her to adopt you put the baby chicks under her at night and take the eggs away at that time. When she wakes up in the morning she thinks they hatched and that they belong to her. These 4 week old chicks will not identify with her and she will not identify with them as other than just chickens.